Founded by entrepreneur Alan Newman and brewer Bob Johnson, Magic Hat began concocting its suds on Flynn Ave. in Burlington's South End in 1994. The company has since moved its production to Bartlett Bay Road in South Burlington, though its offices are presently located on Pine Street in Burlington. North American Breweries bought the company in 2010. In 2012, NAB sold to Cerveceria Costa Rica, a division of Costa Rica's Florida Ice & Farm Co. 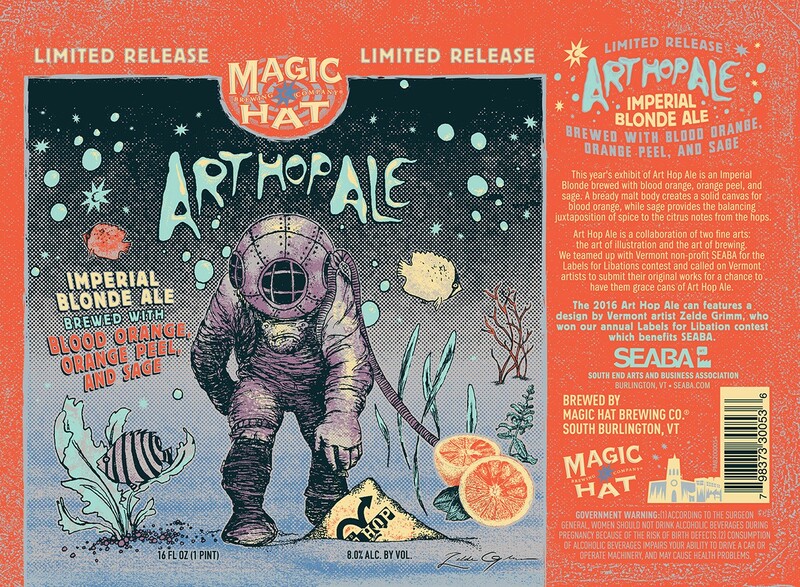 Throughout its history, Magic Hat has made the arts part of its identity and mission. (Fun fact: The brewery's original name was the Magic Hat Brewing Company & Performing Arts Center.) Recent artistic endeavors have run the gamut from soliciting original artwork for the Labels for Libations project to hosting the annual Wall to Canvas event, a live art competition at the brewery that benefits the Shelburne Craft School. Art Hop Ale label with illustration by Zelde Grimm. This is only the second year SEABA has nominated a business for the award. According to SEABA director Adam Brooks, that's because he hadn't even heard about the BCA 10 until Americans for the Arts approached him two years ago. "They came to me after hearing about our little South End Arts District and the South End Art Hop, and thought maybe we should nominate a business," Brooks writes in an email. "Dealer.com has been outstanding in supporting the arts community, so they were a logical choice." Deciding who to pick this year wasn't easy, Brooks says. "There are many south end businesses who make it part of their mission to support the arts. That's what makes this district tick." But Brooks notes a few projects that put Magic Hat on the organization's radar. He cites Labels for Libations, which began in 2012 during Brooks' first year as director. The competition solicits artwork from local creators to adorn a limited edition 22-ounce "Art Hop Ale." Recent winners have included Zelde Grimm and Hillary Glass. Brooks also mentions the company's support of nonprofits such as the Shelburne Craft School and Big Heavy World. Magic Hat hosts the HeavyFest music festival, a BHW benefit, next Saturday, May 20, at the brewery. "They are an extremely creative and artistic-minded business," Brooks says. In an email statement to Seven Days, Magic Hat brand manager Lisa Kelly writes, "Since we opened our brewery doors in 1994, [Magic Hat has] embraced our incredible and vibrant arts community and wished to play a big part in that and help nurture and grow it." Kelly notes that the brewery also hosts art exhibitions in its retail store and tasting room, the Artifactory. "We are proud to work with and support SEABA and participate in the South End Art Hop year after year," Kelly continues. "We invite the local Burlington arts community to share this award with us. Because without their inspiration and welcome, we would not have found ourselves in this amazing position."